An initiative taken to uphold renewable energy in Sri Lanka, the Green Energy Champion 2017, recently awarded Rs. 14 million worth of facilities to the winners of its competition. The German Federal Foreign Office, together with the Ministry of Power and Renewable Energy of Sri Lanka, the project implementing partner Deutsche Gesellschaft fur Internationale Zusammenarbeit (GIZ), and supporting partners Sri Lanka Sustainable Energy Authority (SLSEA), launched the Green Energy Champion Sri Lanka initiative, a country-wide competition to identify and recognise innovative ideas on improving energy efficiency and encouraging the use of renewable energy in Sri Lanka in 2015.The project comprises a twofold approach including a cross-media campaign and an island-wide Green Energy Champion competition, encouraging the best green energy idea. The country-wide competition, after going through over 80 green energy ideas from individuals, local government institutions, community-based organisations, SMEs and NGOs, inaugurated the facilities worth Rs. 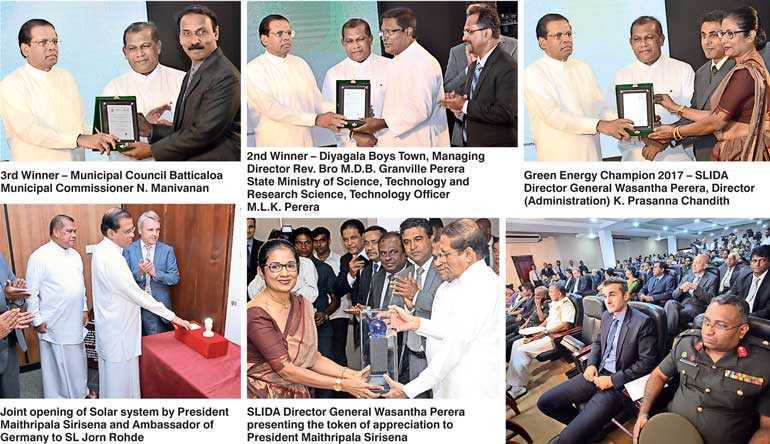 10 million awarded to the winner of the Green Energy Champion 2017, Sri Lanka Institute of Development Administration (SLIDA) for the implementation of their proposed project, which focuses on solar power, bio gas and energy efficiency. The second phase of the Green Energy Champion project honoured two more winners this year. Diyagala Boys Town, who were placed second, were awarded with Rs. 2.5 million worth of equipment to implement their proposal, while the Batticaloa Municipal Council was awarded equipment worth Rs 1.5 million after placing third. “There’s still a long way to go to realise a fully sustainable and green future. I hope that we can continue that program in the future because in Sri Lanka, every project that can be realised also reduces the cost of fuels. Energy consumption rises from 5-10% every year in Sri Lanka. Therefore, I’m very glad that we could help this program, that we could realise it, and implement it. And if we want to succeed to live in a planet while reserving for the next generation, changes in the industry need to happen fast,” he added. Public Administration, Management, Law and Order Minister Ranjith Madduma Bandara stated that the biggest challenge when looking into the future was how we could save the environment and generate more energy, while appreciating President Maithripala Sirisena for the support and the leadership that he had given in saving energy and making a greener country for the future generations. “Initiatives to promote and produce more green energy have been started, especially in the private sector, and also in the Government. SLIDA has been able to become a great example related to environment conservation,” he added. SLIDA was able to prepare a compost yard dedicated to solve the garbage disposal issues within the premises. SLIDA, as the premier national institute responsible for the training of public sector executives, also installed an exemplary biogas unit, which helps generate bio gas through consuming kitchen or garden waste, for basic cooking purposes at the institute cafeteria.